Fortnite's post-rocket rift is growing fast according to these screenshots - what does it mean? When Fortnite finally had its super-cool rocket launch event, it left something behind teasing changes on the way to the Fortnite map. The launch was a one-time-only thing, but the giant, glowing rift it put in the sky is definitely getting bigger with each passing day. You can't tell just by watching over the course of a single match (and you probably wouldn't want to stand around staring at the sky for that long), but Reddit user Discount_Pringles has compiled some photographic evidence of the enlarging of the rift - or 'fracture' or 'giant space spiderweb' or whatever you want to call it - as Fortnite season 5 approaches. When is Fortnite mobile coming to Android? The great thing about these photos is that they were taken from the same location and roughly the same in-game time of day, so you can focus exclusively on the differences in the rift. Nice scientific method, Discount_Pringles! It's definitely getting bigger faster than the comet did back in season 3. Not only that, but smaller, er, anomalies have appeared across the map, one of which can be found at Lonely Lodge, and another at the hotel in the northern central part of the island. They seem to be getting bigger too, naturally. It'll be cool to watch these things keep expanding and popping up in new places as the season nears its end. But there's no way Epic is just putting on a cool light show; it must be teasing or otherwise narratively paving the way for something even bigger, right? Theories are rampant already: some think it may be a series of rifts in the space-time continuum left behind by The Visitor (that creepy alien-ish character who emerged from the comet) as they used the rocket to return to their home. 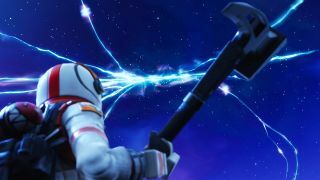 Others think the rocket punched a hole in a colossal, otherwise invisible dome or force field around the battle royale island. Whatever becomes of the giant space spiderweb, we'll all be waiting with eager anticipation. And make sure you watch the whole event unfold below if you missed it the first time around. Wonder how Fortnite became a global sensation? Check out our in-depth look at the evolution of Fortnite.